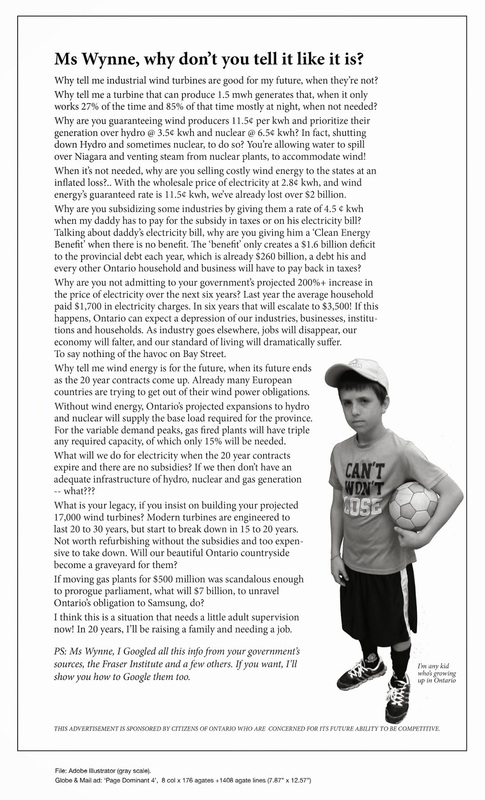 Turbines & Property Devalue | Mothers Against Wind Turbines Inc. Living in the footprint of industrial wind turbines. In the article “Renewable Energy’s Dilemma” (CC Jan. 22), Candice Goodchild introduced the perspective of a grassroots group in Chatham-Kent, Ontario called Water Wells First. This group was formed to protect the sensitive aquifer in the area from vibration damage caused by the construction and operation of industrial wind turbines (IWT). I am a member of that group, and I would like to share my story with you. My family and I live inside the footprint of the North Kent Wind 1 (NKW1) project, built in the northeast part of Chatham-Kent, Ontario. The wind farm is built and managed by Pattern Energy (out of Texas) and Samsung (out of Korea). We live on an acre of land, surrounded by farmland. We have enjoyed quiet country living that included an unlimited supply of good, clean water from our well. However, last summer, during the construction of the NKW1 project, our property was surrounded by three pile drivers. The particular style of construction for industrial wind turbines requires the use of piles to support the foundations. In this case, 18 to 24 piles are used for each of the 34 wind turbines in this project. Three turbines were erected within one kilometre of our house. Pile driving began on July 27, 2017. The next day, while my husband was in the shower, the water stopped running. Upon investigation we found that the sediment traps we had installed on our water line were choked with thick, black sediment – something we had never seen before. Chatham-Kent sits on a unique geological bedrock formation called Kettle Point Black Shale. The aquifer that feeds hundreds of wells in Chatham-Kent is shallow and quite fragile. It rests on that black shale, trapped in layers of glacial sediment. Black shale is known to naturally contain lead, mercury, arsenic and uranium. In 2012, the East St. Clair wind project was constructed in northwest Chatham-Kent, which has the same black shale formation as other areas of the county. Many well owners in the area experienced the same black water we found in our well. Investigation by private citizens and scientists hypothesized that the vibration from pile driving and the operation of wind turbines had disturbed the aquifer under the East St. Clair project, causing the release of sediments into the aquifer. As a result, the water turned black from the shale particles. When the NKW1 project was to begin, farmers and residents from the area mobilized to inform government officials about the potential danger to the aquifer from pile driving. This became the group Water Wells First. Our warnings and pleas were ignored, and construction began. Lots of problems with wind turbines in these wind farms. The noise causes sleep interruptions and sleep deprivation. The noise and shadow flicker “strobe” effect is not tolerable. The noise is thumping like heavy bass inside your house. It does not seem like a big deal outside, but INSIDE the house is terrible. Don’t make the mistake of purchasing a home near any wind turbines. Oops it has happened again! Wainfleet has a turbine missing its blade or what the wind industry likes to call “a rare event” or in fanciful terms, a component liberation. Turbine 5 haunts the horizon in the Wainfleet Wind Energy project. The installation is comprised of 5 Vestas V100-1.8 MW which have a hub height of 95m and a rotor diameter of 100m. This smaller project began commercial operation in 2014 and is one of many wind projects for the rural area of southern Ontario. Only three years old and a broken blade already needing to be removed. Nothing new to see here, just a whole lot of useless mess to get rid of. Words and their meanings have powers that can impact our very well- being. Judge Cornelius J. Moriarty II, of the Justice of the Superior Court ordered the cessation of the operations of the wind turbines in Falmouth, Massachusetts. In giving his judgement he discusses findings and reasons while interpreting and applying the meanings of the words injurious and nuisance. A neighbor of the town’s turbines e-mailed us last week to say that we have been misleading the public by stating in recent stories that Judge Moriarty ruled that the turbines were a nuisance to the Funfar property. A nuisance, he wrote, is generally thought of as a neighbor mowing the lawn on a Sunday morning, whereas Judge Moriarty defined nuisance not only as an inconvenience but also a danger. He attached a copy of the judge’s decision for our reference. In fact, Judge Moriarty went into a good deal of detail in a five-page discussion of his findings and decision. First, he pointed out that the Zoning Board of Appeals’ decision that the turbines constituted a nuisance could not be overturned, as the board would have had to have been unreasonable or on legally untenable grounds. The appeals board found that the turbines were a nuisance to the Funfars’ property because, based on a DEP sound study, they directly affected the health and well-being of the Funfars. “The decision here was hardly arbitraray and capricious,” Judge Moriarty wrote. There should be no mistake among the residents of Falmouth; when the appeals board and Judge Moriarty called the town turbines a “nuisance,” they did not mean it in the way of ants at a picnic or a dog barking in the night. Paris – The noise of new wind turbines may justify the cancellation of the purchase of a house if the buyer claims it. The purchaser, faced with this nuisance, may in fact invoke his own misjudgment which has vitiated his consent, especially if he has been preoccupied with the environment before buying, judges the Court of Cassation. Although no one is at fault, the error of one of the parties leads to a defect in his consent which justifies the handing over of things to their former state, that is to say the reciprocal restitution of the house and its price, Admit the judges. Since the construction of wind turbines is not a question of town planning, it may not be reported as such to the future purchaser, To inform the city council on urbanism projects, observes the judges. This future purchaser can not therefore complain that it has not been reported to him. It would have been necessary to ask precisely the question of a project of installation of wind turbines. But in any case, even informed of the project, the seller could make a mistake as to the significance of its consequences. In short, the seller, purchaser, notary and administrations are excusable because, knowing the project, nobody could imagine the magnitude of the nuisance. It was only when they appeared that the purchaser could see that if he had known, he would not have bought.